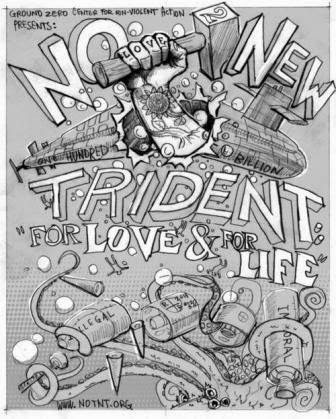 NO To NEW TRIDENT - For LOVE & For LIFE: Calling on Congress to say NO To NEW TRIDENT! Calling on Congress to say NO To NEW TRIDENT! 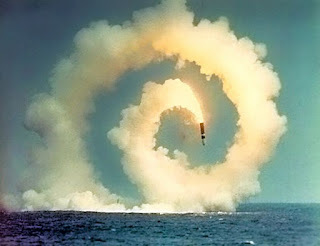 Do we really need to replace the current Trident ballistic missile submarine fleet - an archaic, Cold War, first strike nuclear weapons system carrying enough nuclear warheads to incinerate millions of human beings, leave lethal radiation for generations, and cause nuclear winter and global famine??? Dr. David Hall, a member of Ground Zero Center for Nonviolent Action, wrote the following open letter to U.S. Representatives Rick Larsen and Adam Smith, both of whom serve on the House Armed Services Committee. In it he asks our elected representatives to consider the costs - economic and human of Trident. Dr. Hall's letter was originally published in the Opinion page of The Journal of the San Juan Islands on December 3, 2013. What is the face we Americans truly wish to present to the rest of the world? How inhumane and destructive are we Americans willing to be to remain “secure”? Today we project our nuclear weapons capabilities around the globe with our Trident submarine warships, each a first strike weapon, and each armed under current treaty restrictions with sufficient firepower to incinerate hundreds of cities and black out the sun for weeks to months (“nuclear winter”). Iran seeks to build its first nuclear weapon and the political noise in Congress sounds like the EA-18G Growler over Anacortes. Israel with our support has amassed over 80 nuclear warheads, and we are modernizing ours. Congress has already spent over a billion dollars to design the new Trident fleet for Cold War level patrolling of the world’s oceans through 2080, at costs estimated at $347 billion. We managed to avoid the financial cliff created by a fractured Congress that could not agree in 2011 on a solution to outspending our resource base. Japan and China each hold over one trillion dollars of our national debt, yet the Trident fleet can only be justified, if at all, against an adversary like China. Certainly not North Korea, Pakistan or Iran. Russia remains our only serious nuclear adversary and we are cooperating with them and with China. American Cold War policies reflexively supported military budget requests as a way to spend the Soviet Union into oblivion. For President Gorbachev, another critical piece in backing away from the nuclear arms race was learning about nuclear winter and the devastating effect it would have on all life on Earth. We now have climate models for a possible nuclear war between India and Pakistan which predict a global catastrophe that could kill a billion people, many of whom already face malnutrition. New data from China double the possible death toll due to declines in China’s winter wheat and the resulting economic chaos. One Trident warship loaded within current treaty restrictions to half its capacity carries 10 times the nuclear firepower of this modeled two-nation war. We don’t need 12 new Trident warships each capable of creating nuclear winter. Support for this omni-cidal weapons system derails us from essential investments in our spiritual, physical, emotional, and economic health as a nation. Our credibility further erodes among those who rightly or wrongly mistrust our dedication to a peaceful planet. Now is the time to stop the rebuild of the first-strike Trident nuclear weapons fleet, and instead to model intolerance for all weapons of mass destruction, expand our investments in diplomacy and foreign assistance, support truly democratic institutions worldwide, and live by treaties we have signed that outlaw weapons of mass destruction for the very reason that they cause indiscriminate calamity for innocents and destroy ecosystems essential to life. We owe it to our grandchildren to act now. The two of you have a special role to play on our behalf. Sincerest thanks for your years of generous public service. — Editor’s note: Dr. David C. Hall of Lopez Island has been a board member of the national Physicians for Social Responsibility (‘91-’03), Washington Physicians for Social Responsibility (‘83-’11), and volunteer coordinator with Ground Zero Center for Nonviolent Action.